NorLSAR were very happy to attend 2017 Brundall Boat Show. It was a very well-organised event and well-attended. 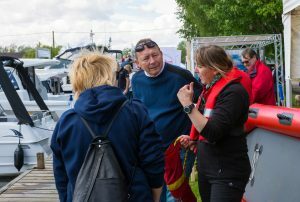 The NorLSAR team had a tent in the grounds of the Norfolk Yacht Agency, and members of the NorLSAR water team were on hand to talk to the public about water safety. NorLSAR members talked about water safety to members of the public and taught them how to use throw ropes. The water team also gave two demonstrations during the day. 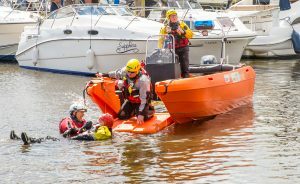 Several different rescue techniques were shown including ways to rescue a person in the water while remaining on shore, and ways of rescuing a person from a flood relief boat. 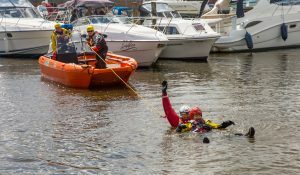 The NorLSAR water team demonstrating one way to rescue a person in the water. Bringing the rescued person aboard the rescue boat. Many people gathered to watch the displays and several took the opportunity to practise with throw ropes after the demonstrations.